The University of Applied Arts in Vienna is composed of a series of buildings arranged individually in a large urban area. 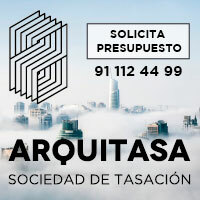 In the past, to facilitate the functional integration between these constructions, several interventions were carried out randomly at ground level, without any of these works guaranteeing the visual unity of the whole. The contest held in 2011 aimed to recycle one of the buildings and intervene on the campus to strengthen a concept of unity. 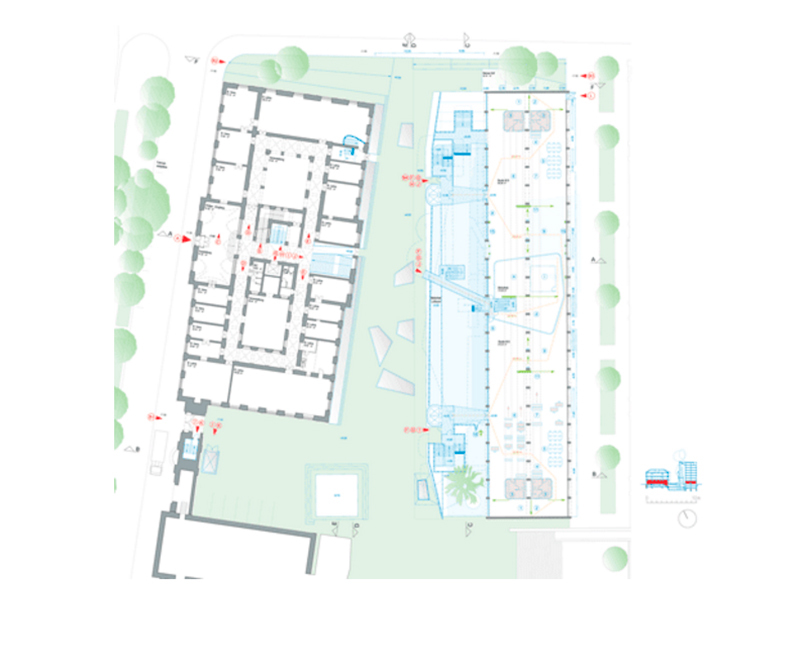 In response to these conditions, the winning project proposes to reverse the image of a campus formed by a set of loose buildings to compose the identity of an urban block. Its development explores two visions that enhance this idea from its visual antagonism. 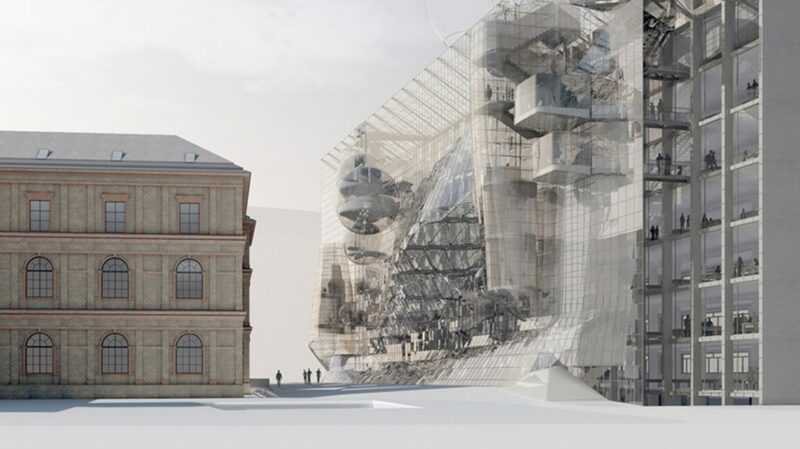 On the one hand it proposes a meticulous intervention on existing buildings, which consists of demolishing all that added construction to link the buildings together. This criterion implies the reconstruction of those parts that were destroyed by these interventions and the value of each building. 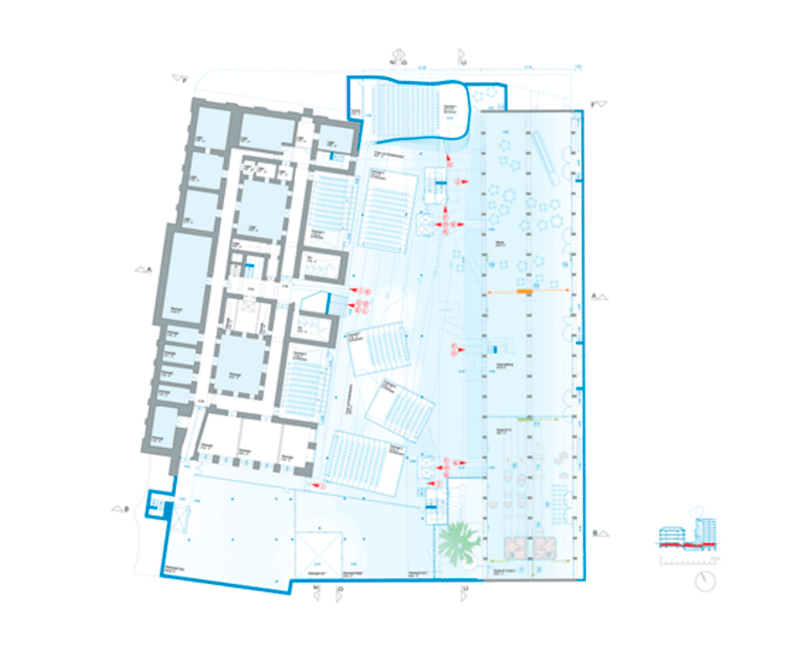 The connection between these constructions is proposed from a common functional base located under the courtyard, which contains the conference rooms, workshops, warehouses, technical facilities, supply lines and waste management. The other decision is to intervene radically on the building to be recycled. 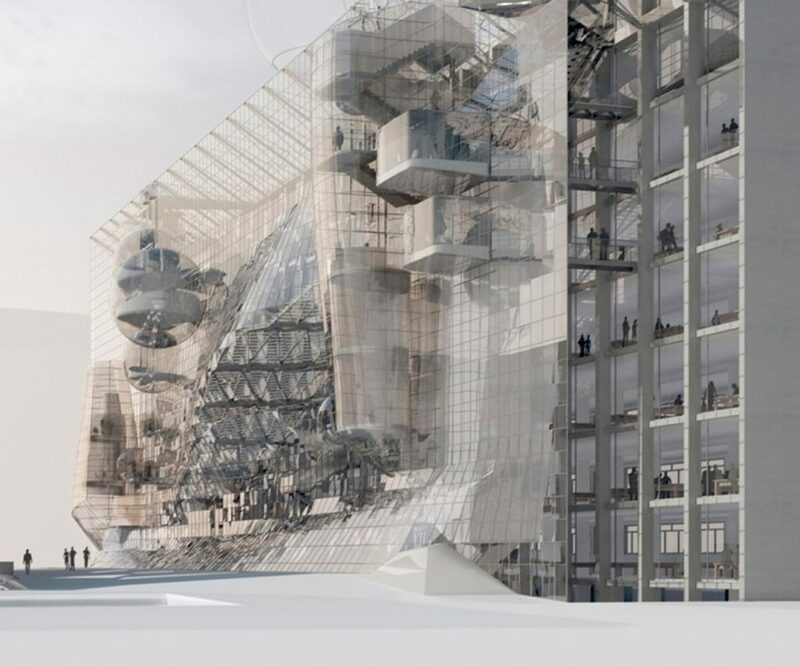 For this, it is proposed to leave the resistant structure in its purest state, removing walls and moving the stairs and lift boxes to the exterior of the building. This release of the plants allows multiple functional readings and a greater flexibility of uses, which facilitates the creation of extended areas for the conference rooms and workshops required by the program. The envelope that covers the side where the vertical circulations are located fulfills a fundamental role to achieve the applied criterion. 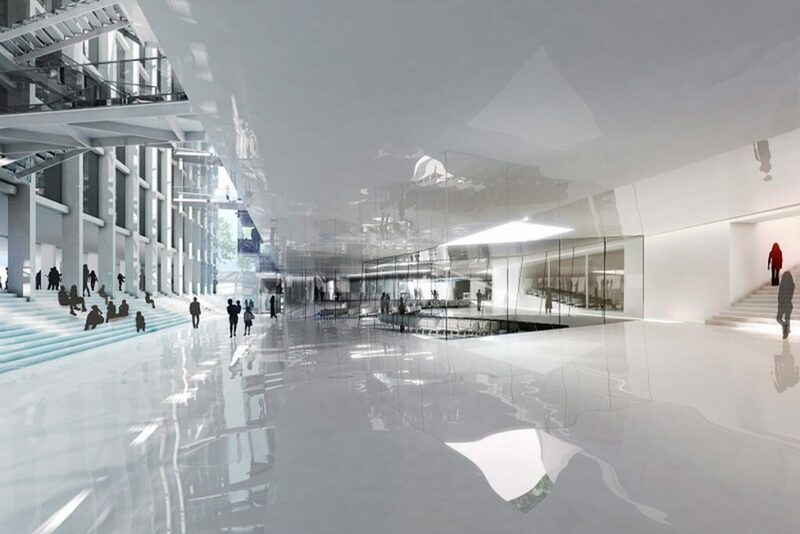 It is arranged as a wavy glass blanket that allows to visualize the campus from the inside and the flow of internal movement from the outside. To accentuate that feature, a staircase on a section called “Broadway” traces a diagonal on the longitudinal side of the elevation to link all the floors. The “Broadway” is not only intended as a circulation space; it is also a platform where members of different study groups meet to carry out transversal disciplinary projects in the manner of an informal market. 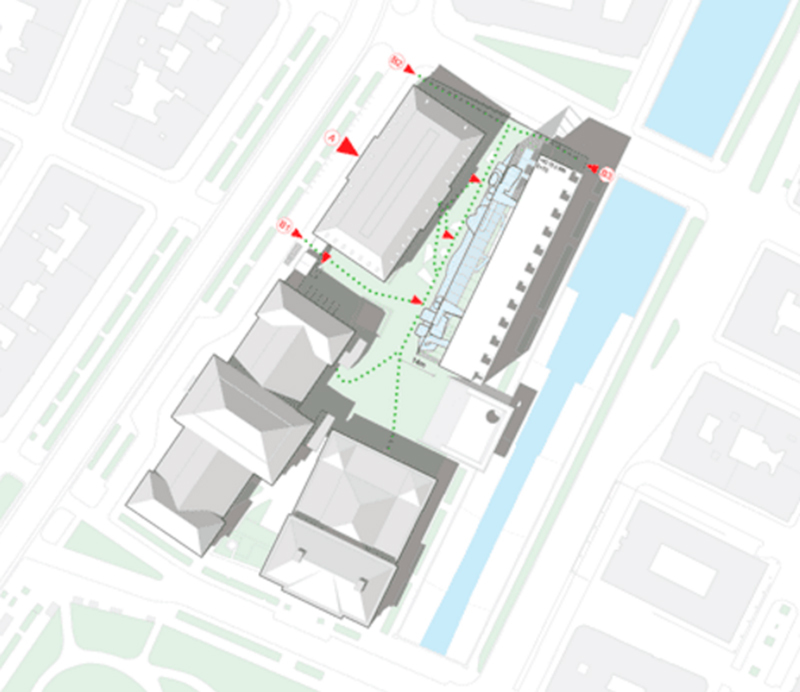 The intention of the urban block is embodied in the conjunction of the three elements that make up the intervention: the interior square that connects the functioning of existing buildings, the garden that acts as a unifying element of the buildings and the undulating facade that makes the activities transparent to and from the museum. 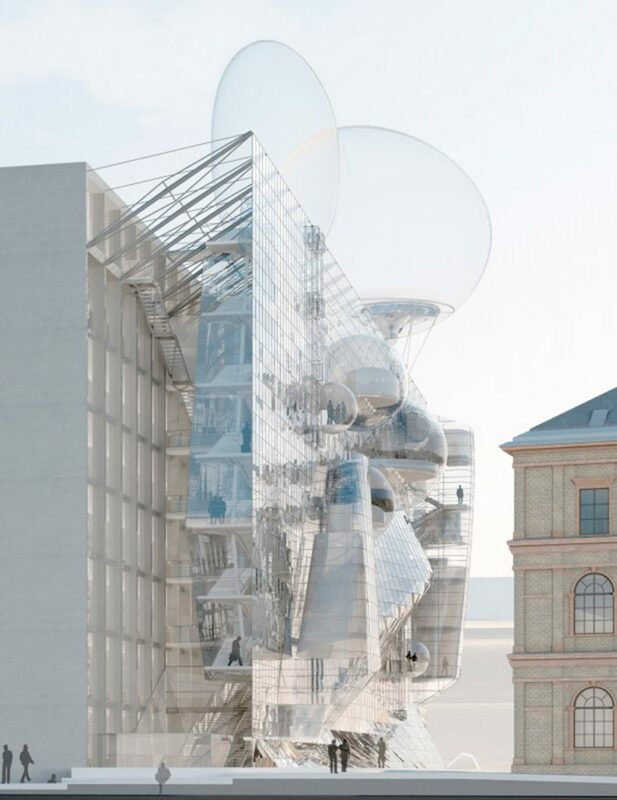 On the terrace of the main building, two pneumatic balloons attached to the structure are inflated to inform about the different events that take place on the campus. Tschapeller reconsiders the character of the campus with his intervention without avoiding the disagreements that arise with the rigorous historical structures. On the contrary, their bet relegates the formal issues to make the activity that is developed within them transparent, promoting an intricate visual integration of the school of applied arts with the rest of the campus. This intervention, which can be considered audacious in its character or contradictory in its development, refuses to be indifferent in the way of intervening on existing urban facts, without dispensing with the use of singular conventions. 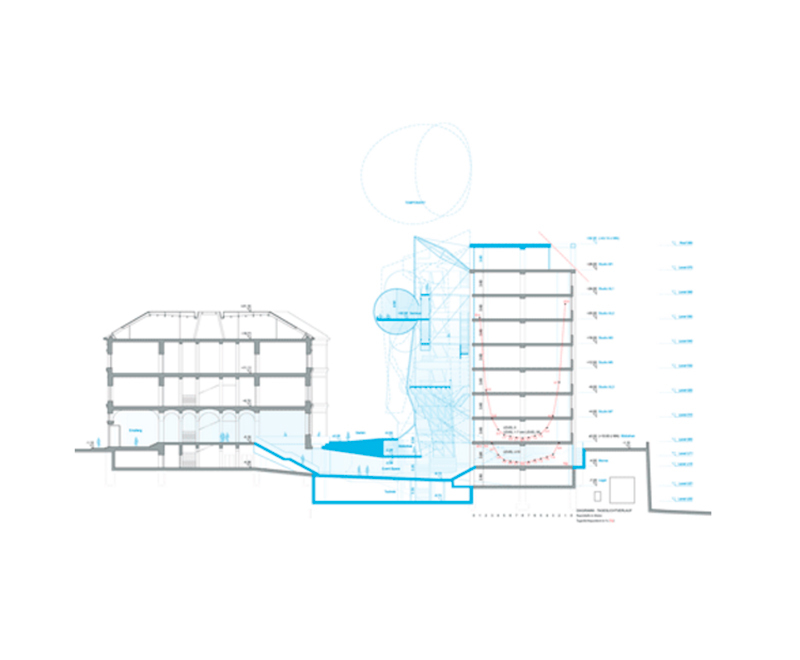 1 Ignasi de Solà-Morales, Theories of architectural intervention. Quaderns d’arquitectura i urbanisme, nº 155, Colegio de Arquitectos de Cataluña, Barcelona, 1982.